The 73‑note version of the Continental measures 110 x 35cm and weighs 8.4kg. Good news for your road crew. We’ve come a long way since analogue multi‑keyboards such as the Siel Orchestra offered piano sections that sounded nothing like pianos, organ sections that sounded almost nothing like organs, and strings and brass sections that, even if you were out of your tree, sounded only vaguely like strings and brass. Today, you can barely go to a gig (well, a gig during which the keyboard player actually plays the keyboards) without espying a red slab of Scandinavian technology that produces pianos, organs, and orchestral imitations of such realism that few would notice that the band is no longer touring with half a ton of vintage keyboards, nor a minibus full of stroppy MU members. 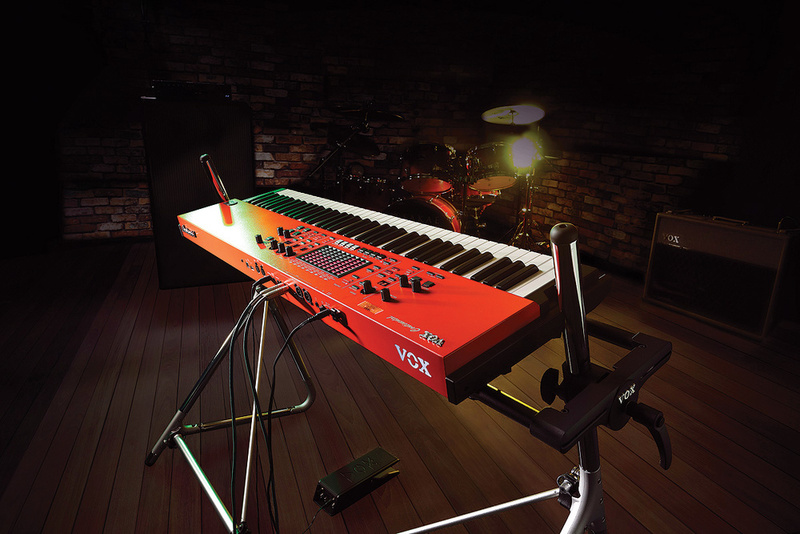 It’s into this arena that Korg, who have owned the Vox brand since the 1990s, have chosen to resurrect the Vox Continental name, attaching it to a digital multi‑keyboard that also produces the sounds of pianos, organs and a range of other instruments. But is there a place for another red (or, to be more accurate, deep orange) keyboard in a market that has been dominated by a single Swedish manufacturer for nearly two decades? Korg’s Vox Continental (which, henceforth, I’ll call the Konti) contains four sound generators: organs (a Hammond courtesy of the CX‑3 engine, plus Vox and Farfisa models), acoustic and electric pianos courtesy of the EP‑1 and SGX‑2 sound engines from the Kronos, and a simple synth derived from the AL‑1 and HD‑1 engines introduced on the OASYS. The outputs from these are then passed (or not, as you choose) through five effects sections before reaching the outside world. It’s available in both 61‑ and 73‑key versions. Their waterfall keybeds are velocity‑sensitive, but they don’t generate aftertouch, nor does the sound engine receive it. This is a shame because the instrument is devoid of performance controls apart from a recessed lever within the left‑hand cheek and the provision of sockets for damper and expression pedals as well as a rotary speaker fast/slow footswitch. Nine velocity curves provide the usual range of responses, and there’s a Dynamics function that compresses the range to make it easier to generate forté at the expense of piano. There’s also an option that allows you to reduce the amount of key travel needed to activate notes. This emulates the response of many organs, although all of the active footages are triggered simultaneously; there’s none of the slight spread that you can obtain when you depress a key slowly on a multi‑contact keybed. You can split the keyboard into upper and lower parts either side of a single user‑defined split point, but this facility is only available for two of the organs (for some reason, the Farfisa is precluded) and there’s no way to play piano or lead synth with your right hand while ’comping on organ or strings (or whatever) with your left. However, you can layer two of the sound generators by pressing their selectors simultaneously. The most prominent feature of the Konti’s control panel is its bank of nine touch sensors that control the organ voicing, the synth settings, and the global graphic equaliser. You make changes by sliding your finger up and down the display itself, or by tapping the position to which you want it to jump. I found the resolution to be a little coarse but, despite a bit of latency when doing the equivalent of grabbing a fistful of drawbars, it’s not a bad system and, unlike physical controllers on a digital instrument, the sensors always show the current settings. However, I noticed that their LEDs are barely visible in bright sunlight, so beware festivals if you’re not topping the bill. Whichever organ mode you choose, the voicing is unconventional, although this is most apparent for the Hammond emulation. Rather than providing a full set of controls, the Konti offers 19 preset Variations that form the basis of any new registrations that you care to program. So, while the standard set of nine drawbars is provided, there’s merely an on/off button for the percussion, and no way to determine its pitch, nor whether it’s long or short or soft or loud. Neither can you choose the chorus/vibrato setting. Instead, there are preset settings within the Variations — for example, #15 (Jazz Organ 4) has percussion set to 4’ while #18 (Quiet Hymn) has it set to 2‑2/3’. Unfortunately, there’s nothing in the documentation to tell you which settings exist within which Variations, so you have to go hunting. The Vox model is based upon the dual‑manual Vox Continental II and Super Continental, with 16’, 8’, 4’, Mixture II and Mixture III drawbars for the upper part, and 16’, 8’, 4’ and Mixture IV drawbars for the lower part, with control over the relative contributions of the sine wave and triangle waveforms. The underlying sound is very good, combining the tone of the original with just the right amount of grit to fool you into thinking that you might be listening to a vintage instrument, and the 11 Variations provide useful variants upon this. However, the only additional control is vibrato on/off, which means that there’s no percussion. Later versions of the dual‑manual Continentals offered this; generally 8’ and 4’ with a switch for short/long decay and sometimes for loud/soft volume. Omitting it from the Konti seems like a poor decision. Lacking the 2‑2/3’ tabs and the brightness tab of the Compact Deluxe, the Konti’s Farfisa model is based upon the earlier and less capable Compact model, offering tabs for Bass 16’, Strings 16’, Flute 8’, Oboe 8’, Trumpet 8’, Strings 8’, Flute 4’, Piccolo 4’ and Strings 4’, as well as a Multi‑Tone Booster with 16’, 8’ and 4’ tabs. There are no separate tabs for Multi‑Tone Booster and All Booster but the ninth of the touch sensors controls the brightness of the Booster sound, which is an interesting alternative. In line with the earliest Farfisas, there’s no percussion, but vibrato is again limited to on/off, with no slow/fast or light/heavy controls. Furthermore, the vibrato rate and depth is consistent across all of the 11 Compact Variations. The underlying sound is again good, but the sheer aggression of a Farfisa in full flight is perhaps the hardest of the combo organ sounds to recreate and, even when compared with a Compact rather than a Compact Deluxe, the Konti is a perhaps bit too polite. The organ section also includes the Konti’s rotary speaker effect, which emulates a dual‑rotor Leslie but offers no controls other than on/off and fast/slow. Any given Leslie offers no more unless you open it up and adjust the drive belts, but there are many ways to record one, and I would have hoped for control over the fast and slow speeds, acceleration and deceleration, and microphone positioning. Nevertheless, the effect is nicely implemented within its constraints and very pleasing in both its chorale and tremolo modes. The second sound engine also divides its sounds into three sub‑categories: tines (nine Variations of Rhodes sounds), reeds (six Variations of Wurlitzer EP200 sounds) and FM (seven Variations of DX7‑type sounds). In all cases, the control lever acts as a tremolo on/off switch, but there are no other controls available to mould the underlying sounds. Fortunately, there’s a good range of instruments to be found in the Variations, and names such as Mk1 Amp, Mk1 Phaser, Mk V, Dyno Chorus and EP200 Tremolo give you a good idea what’s going on, although you have to download the Voice Names List from the web site to discover them. Interestingly, the preset effects built into these sounds are in addition to those that you access via the visible effects sections so, for some of these sounds, you can combine tremolo, an integrated effect, and then your selection from the effects that follow. Similarly, the acoustic piano engine is divided into three banks of presets: six grand pianos, seven upright pianos and five electric grands. The grand pianos and uprights use full‑duration samples so there’s no looping and a natural decay to the notes. I tested this using my preferred Variation (Grand Piano 1), and found that it exhibits no unpleasant discontinuities in either velocity or tone as you play up and down the keyboard, and has a long and pleasing decay. As always with Korg pianos, the grands lack the deep, rolling character of some of the pianos from elsewhere, but they have their own personality. I can take or leave upright piano sounds, but the first of the two CP80 emulations will work well for all of your late‑’70s Genesis impersonations. As for the rest, well, you may find a use for them. The fourth sound engine provides 69 additional Variations divided into six categories: Keys, Brass, Strings, Lead, Synth and Other. Some of these are very good; I particularly like the Clavinet Variations because they offer a damping control that makes them superior to almost all of the other emulations that I’ve encountered. I also found the lead synths to be much more useable than I had imagined, as are many of the other sounds. Each of the Variations has two adjustable attributes such as an integrated effect, a sub‑variation or a parameter called Sound Character, and these extend their palettes considerably. They’re also touch‑sensitive, with velocity affecting elements of the sound such as the volume, the brightness, or the rate at which the sound ‘speaks’. In addition, there are seven conventional synthesizer parameters available for each: the cutoff frequency and resonance of a low‑pass filter, the attack, decay and release times for the audio signal amplifier, and the depth and the rate of an LFO directed to the pitches of the notes. I was surprised to find that the filter will oscillate at maximum resonance although, with no control over its contour or tracking, this is less useful than you might hope. Having said that, these parameters can add a great deal of variation to the initial sounds. The Konti’s five effects sections comprise a multi‑effects unit offering chorus, phaser, flanger, compressor, drive and wah, followed by dedicated delay and reverb units in parallel, followed by an equaliser, and finally a valve overdrive. The settings for the multi‑effects, delay and reverb are stored on a scene‑by‑scene basis, but those for the EQ and overdrive are not, which is sometimes annoying. Nonetheless, you can jump from an auto‑wah’ed Wurli to a digitally overdriven lead synth with lashings of delay at the touch of a button, which is no bad thing. You can only select one of the multi‑effects at a time, and your control over each is minimal — an on/off button plus a single knob that controls two parameters. The user manual doesn’t tell you what these parameters are, but you’ll find them listed in the Voice Names List. The one effect that steps beyond these limitations is the wah; a dedicated and very solid expression pedal is included with the Konti, and the two work very nicely together. The delay line offers simple, cross, tape and modulated delays, with control over the depth, the tempo and the feedback. There’s no way to set the delay in milliseconds but, while the manual makes no mention of this, it will sync to MIDI Clock. Since the maximum gain of the feedback loop in tape mode is greater than unity, you can use this to generate some unexpected sci‑fi effects. It was while experimenting with this that I found that the delay time is also the tremolo speed for the electric piano sounds, which can be a bonus (although not always). Alongside this, the reverb offers five modes — two halls, two rooms and a spring — with control over depth and room size/reverb time. The graphic EQ is a global effect that offers nine peaking bands in octaves with centre frequencies ranging from 63Hz to 16kHz, with gains of ±12dB. Adjusting the bands using the touch controllers is quick and intuitive but, since it’s not always very accurate, it’s not something that I would advise you to do in front of an audience. Finally, the sound reaches the analogue overdrive, which is generated by a new type of valve called a Nutube. Although the gain from this is smaller than that of a traditional valve, it offers several advantages: it has a low power requirement, it operates at lower voltages than are traditionally required, and it’s small. As you wind it up, the Nutube imparts anything ranging from chunkiness, through a mild overdrive to a gentle growl and, within its limits, it does a nice job, working particularly well with the electric pianos and even things such as the Mellotron sounds in the Key/Layer section. What it doesn’t do so well is work correctly with the organs. You can’t overdrive a sound after it has passed through a Leslie speaker, and I can’t imagine why manufacturers think that placing overdrive after a rotary speaker effect is anything other than daft. Since the Konti is designed as a gigging instrument, let’s get some important issues out of the way. It’s light, it’s sturdy, and I don’t see it coming to grief while on the road. It should also remain reliable with little or no maintenance, which is more than I can say for the vintage instruments that it seeks to replace. Furthermore, the keybed is a reasonable compromise for players who want to mix organ swipes and synth solos with traditional piano performance. I would always choose the 73‑note version over its smaller sibling, and this has the added bonus of a wide, flat surface to the right of the controls that’s large enough for a small laptop or tablet, or even a small MIDI controller, all of which could be useful on stage. The pitch‑bend lever is recessed at the left‑hand side of the keyboard.As for the Konti’s sound, let’s start with the organs. These can be excellent, although I found the omissions to be a bit too limiting for my tastes. Why does the Hammond lack the natural compression of the original instrument while the Vox and Farfisa emulations exhibit it? Why does the Hammond lack percussion and chorus/vibrato controls, and why are the Vox and Farfisa modelled on early versions that lack percussion? I have no answers. Nonetheless, there are some nice touches, such as the repurposing of the Dynamics control as a tone booster that adds volume and brightness to the initial sound. Once I had discovered this, it went a long way to adding the aggression that I wanted from the Vox and Farfisa sounds. Alongside these, there’s at least one very useable acoustic grand piano, and the electric pianos are impressive; with the tremolo switched on and a bit of EQ and drive, I lost myself in these. Finally, I was surprised by how much the Key/Layer sounds added to the equation; not just the Clavinets, but (amongst others) the pads, the strings and the lead synths. When layering this section with the pianos, I discovered that I could play and sustain one sound complete with its effects, and then change Scene to play another complete with its effects. Of course, the initial sound disappeared the moment that I released the sustain pedal, but for dreamy washes and new age self‑indulgence, it was rather nice. And, while I would use external processors to get the best from the Konti in the studio, the built‑in effects should be fine for live use unless you need to jump instantaneously from (say) a bright, clean piano to a dark, overdriven Hammond at the press of a single button. Since the EQ and overdrive are global effects, this isn’t possible. But now let’s turn to some other issues, starting with something that I discovered the moment that I plugged the Konti in and switched it on. It can be noisy. Some of this noise is inherent to the sound engines, and you could even justify this as being true to some of the original instruments. But, when using the unbalanced quarter‑inch connectors, the mains hum was not acceptable. I reduced this by plugging the power supply into a different mains outlet from across the room, but that’s not always going to work, especially on stage. Other gripes include the lack of split points and individual transpositions for the sound engines, the fact that you can’t pass any of the pianos or synth sounds through the rotary speaker effect, the arcane method of accessing system functions and, in particular, the lack of performance capabilities. Many players use pitch‑bend and modulation to embellish their performances, whether controlled using wheels, paddles, a joystick, or even a touchpad. On the Konti, you can use the control lever to bend the pitch and the sixth touch sensor to control the modulation depth of the Key/Layer sounds, but you can’t do both while playing unless you have three hands. Furthermore, when you layer sounds, the left‑most section grabs the lever’s control message, so you can’t control Key/Layer sounds when they’re layered with anything else. And, while I’m on the subject of the control lever, why is this recessed on the left? Flicking the Leslie speed from fast to slow and back again is an integral part of organ performance, but the position of the lever makes this nigh on impossible when playing with both hands. Sure, you can use a footswitch, but that’s not the point; the Leslie crescent switch or its equivalent is an important part of an organ’s control surface. My final observation concerns the Konti’s memories, or rather the paucity of them. A program memory is called a Scene, and this stores the current setup except for global settings such as those for the EQ, the valve overdrive, the Dynamics, and the master volume. There are merely 16 of these Scenes, stored in a Set comprising four banks of four. Unfortunately, only one Set can be stored within the Konti itself. You can store up to 100 additional Sets on a USB device, but you can’t access saved Scenes directly over USB; you have to load a whole Set back into the instrument to do so. The limitations of this are obvious and, while the simplicity of creating sounds on the Konti obviates this to a degree, I have no idea why Korg designed it this way. The Konti was conceived as a stage instrument, and live performers need to be able to move programs around or replace them at very short notice — something that it cannot do. There are two ways of viewing the Konti. On the one hand, setting it up and using it could barely be simpler, and it takes no time at all to obtain some excellent sounds from it. On the other, setting it up and using it could barely be simpler, and it takes no time at all to run into its limitations. And therein lies both its strength and its weakness. Like another recent Korg, the Prologue polysynth, this is a keyboard that has been designed for musicians who want to get down to the business of playing. Consequently, you can view it as a very efficient way to obtain some high quality sounds with the minimum of fuss, or you can find it to be too limited for your needs, in which case you’re looking at the wrong product. Korg tend to make the right product design decisions even when they appear to be out of step with the rest of the market — indeed, I found myself enjoying much about the Konti — but I fear that this is one instrument that might be a hard sell. My thanks to Neale Whyatt, who lovingly repaired my Farfisa Compact Deluxe so that I could make the comparisons in this review. It’s unusual to find two families of keyboards that are such direct competitors with one another, but the Vox Continental and the Nord Electro 6 do much the same thing in much the same fashion, and in much the same colour and for much the same price. The Nord is by far the more flexible of the two, both in terms of programming and in its ability to access the Nord piano and sample synth libraries. It’s also a tad cheaper. But you may prefer the simplicity and the sounds of the Konti. There’s also the question of style. They’ve both got it, but there’s no doubt that the Vox stands out from the crowd. Lacking individual outputs for each of its sound engines, the Konti offers just stereo outputs on unbalanced quarter‑inch sockets and balanced XLRs, the latter with a ground lift that can reduce noise and eliminate the need for DI boxes. Next to these, a headphone socket carries the same signal but doesn’t mute the main outputs, so be careful or the neighbours won’t be happy. Next to the audio outputs, you’ll find inputs for three control pedals: damper (with half‑damping), rotor speed and an expression pedal input for volume or wah. 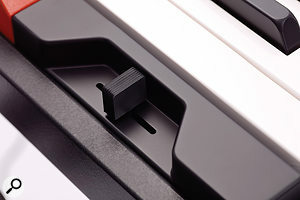 Digital connections are limited to MIDI in and out on five‑pin DIN sockets, plus USB A and B, the former for saving and loading Scene data and the latter for MIDI. Power is supplied by a 15V DC ‘snake that swallowed a wombat’ adapter, which I view as inappropriate for a stage keyboard. The final element of the rear panel is the Vox logo which, as shipped, is illuminated when the power is on. You may like this, but my lighting engineer would loathe it, so he and I are delighted that you can extinguish it. I don’t know why people rave about the Z‑stand for the original Continentals, which is a pain in the arse and far from sturdy. In contrast, modern X‑frame stands can be quick to erect and capable of supporting small battleships, but they are far from attractive. In my view the Konti’s stand, which is shipped with both the 61‑ and 73‑note models, is superior in every respect; well‑engineered, solid and attractive and, with the keyboard bolted on, it will certainly make a statement on stage. (It even allows you to play the Konti in that ghastly ‘pointing at the audience’ fashion that became fashionable in the 1960s.) I applaud Korg for including it rather than charging for it as an optional extra. Similarly, the inclusion of the chunky expression pedal is a welcome bonus. Brownie points all round. The Konti’s MIDI specification is, to be polite, sparse. You can sequence it from a Mac or PC, you can play it from an external keyboard, and you can use an external keyboard as the lower manual of a dual manual Hammond or Vox, but it only receives a handful of CCs, and the list of transmitted CCs is even shorter. This is not a keyboard designed for extensive automation. It’s very simple to configure and use. The sound quality can be first class. It’s light but feels sturdy — an ideal combination for live work. Korg should be applauded for including the excellent stand. The voicing is more limited than you would expect. It has limited performance capabilities. It has limited storage capabilities. The recessed control lever precludes flicking the rotary speaker effect from slow to fast and back again. It’s another stage keyboard with an external power supply. Argh! It can generate considerable background noise. The Korg Vox Continental prioritises simplicity over flexibility. It can sound great and, depending upon how you use it, your audience may never know that you’re using a modern instrument. But if you want a wide range of sounds and greater control over them, you’ll need to look elsewhere. 61-note version £1479, 73-note £1599. Prices include VAT. 61-note version $1999.99, 73-note $2199.99.